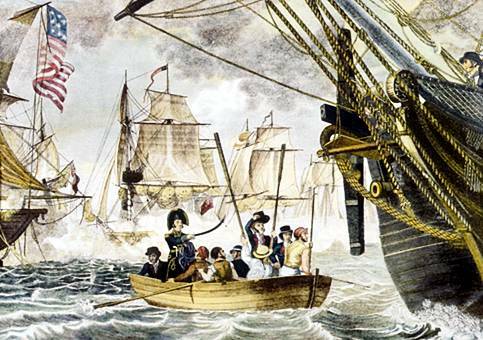 It’s about a famous battle that took place on Lake Erie during the War of 1812. Charlotte, wife of George III, was reputed to enjoy a nip of “Perry,” or pear brandy; which may have affected her judgment causing the British to lose the battle. Although facing many adverse conditions, including lack of men and materials, Perry and his men successfully completed six vessels by July 1813. These six were joined by others from Buffalo. Two months later, on September 10, 1813, the American squadron commanded by Perry fought a British squadron commanded by Captain Robert Barclay, RN. The Battle of Lake Erie began with Perry aboard his flagship LAWRENCE. In the early stages of the battle, however, LAWRENCE and her crew took most of the enemy’s fire. LAWRENCE was severely damaged and over 80 percent of Perry’s crew were killed or wounded by concentrated British gunfire. In an attempt to change defeat to victory, Perry, carrying his battle flag emblazoned with Captain Lawrence’s dying words, “Don’t Give Up The Ship,” transferred from LAWRENCE to the lightly damaged NIAGARA in a small boat. He took command of NIAGARA and sailed her into the British battle line. The British had also taken heavy casualties from the Lawrence’ fire. Broadsides from the fresh NIAGARA compelled their surrender within 15 minutes of Perry’s transfer. Immediately following his victory at the Battle of Lake Erie, Perry penned the famous words, ‘We have met the enemy and they are ours…” in his report to General William Henry Harrison. [Gm] September the tenth in the [Bb F] mor-ning. [Gm] September the tenth in the [Bb F] morning. To the one they despis’d in the morning. September the tenth in the morning.